Agroecology first appeared within the scientific literature in the 1930s as a combination of two traditional disciplines, agronomy and ecology, to study biological interactions between crops and other natural elements of the agro-ecosystem. From the 60s-70s, this field of research has increasingly broaden its vision, by expending its scale of analysis (from plot to farm to landscape level), and integrating other disciplines (interdisciplinary approach including socioeconomic and political considerations). Those researchers were influenced by the study of indigenous agricultures that routinely incorporated mechanisms to accommodate crops to the variability of the natural environment and to protect them from predation and competition without the use of external inputs. The idea of valorising indigenous agricultural knowledge arise among practitioners. In parallel, the emergence of the ecologist movement, fuelled by the realization of the negative impacts of the green revolution, supported the early adoption of agroecological practices among some farmer communities. 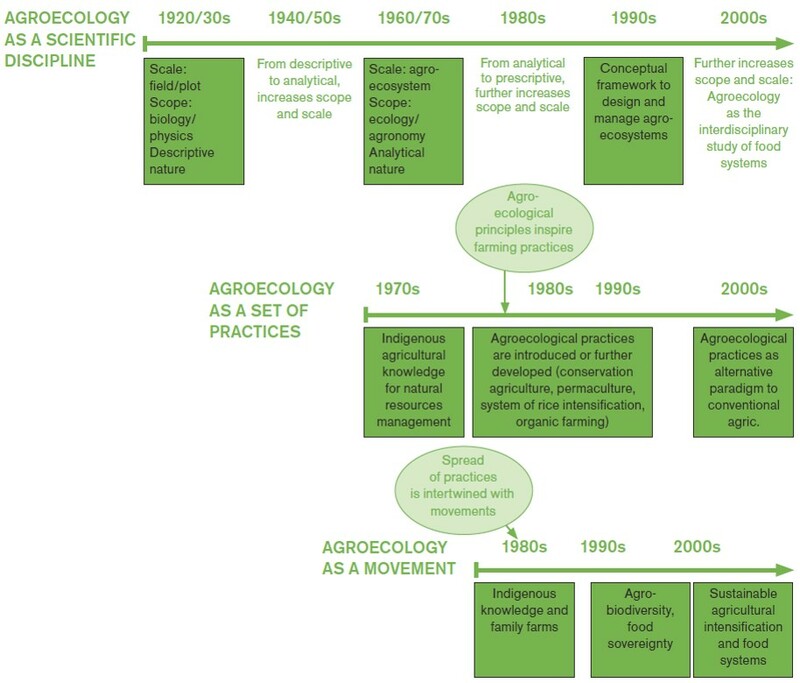 In the 80s, it has provided a conceptual framework for the increasing promotion of agroecological practices both in developed and developing countries. Social advocates and grassroot movements are increasingly standing against industrial food system and in favour of small-scale farmers. Since the 2000s, the agroecological framework has embraced the whole food system, defined as a global network of food production, distribution and consumption. Agroecology is recently increasingly promoted and discussed in various forum and appropriated by new actors. Recent years have seen the emergence of a convergence around agroecology, as shown by continental networks of researchers, students, practitioners and advocates, momentum around symposiums and forums. For instance, a few inter-governmental organizations, authoritative scientific or multi-stakeholder bodies coined internationally agreed definitions (e.g. Food and Agriculture Organization of the United Nations (FAO), United Nations Environment Programme (UNEP), World Health Organization (WHO), Committee on World Food Security (CFS), High Level Panel of Experts on Food Security and Nutrition (HLPE)).